Preheat oven to 450° – preheat baking pan with butter or grease. 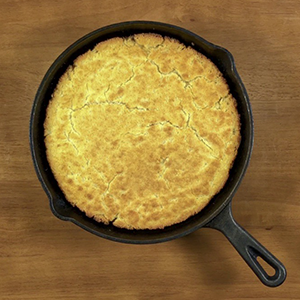 (9-inch cast iron skillet). Beat eggs in a mixing bowl. Add remaining ingredients in order listed; stir until well blended. Pour batter into hot pan and bake 20-25 minutes or until golden brown. Makes one 9-inch pan or 8-12 muffins or 12-16 small muffins. Preheat oven to 450° – preheat baking pan with butter or grease. (8-inch cast iron skillet). Lightly beat egg in a mixing bowl; add milk and oil. Stir in corn meal; mix well. Pour batter into hot pan and bake 20-25 minutes or until golden brown. Use either above recipe and simply split already cooked muffins – butter each side and toast in oven until delicately brown. Delicious for breakfast or other meals. recipe would use Dixie Lily Plain Yellow Cornmeal). Lightly oil loaf baking dish; pre-heat oven to 375 degrees. then make a well and set aside. then whisk in remaining ingredients in the order listed. then fold in dried cranberries and chopped wlanuts. then reduce oven to 325 and bake 15 min. more. Excellent with butter or spreadable cream cheese! then drain well to reduce sweetness; improves loaf moisture.